TAMPA, Fla. (Aug. 18, 2010) - Thirty-eight percent of Florida residents plan to travel with their pet in the remainder of 2010, however 49 percent of them do not restrain their pet when traveling in a vehicle, shows a recent AAA Consumer Pulse survey. 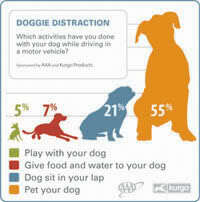 Many people consider their pet a part of the family, yet they may never think to buckle them up when on the road. Although 65 percent of Florida travelers are aware of pet restraint devices, they seldom use them. "Many people remember to buckle themselves up, but forget pets are in as much danger unrestrained as humans. An unrestrained pet not only endangers itself, but everyone in the vehicle as well, said Michele Harris, director, AAA Traffic Safety Culture. "As fun as it may be to travel with your pet, safety should be the number one concern." Pet owners may not realize the amount of force a pet can generate when in a vehicle crash and unrestrained. An unrestrained 10-pound dog in a crash at 50 mph will exert roughly 500 pounds of pressure, while an unrestrained 80-pound dog in a crash at only 30 mph will exert 2,400 pounds of pressure. This amount of force can cause serious injury and/or death to not only the pet, but passengers as well. A variety of products are available that can reduce the amount of distractions a pet can cause when in a vehicle and, at the same time, keep everyone safe. AAA recommends owners utilize a restraint system anytime they are driving with their pet-even close to home. Pet vehicle restraints are sold at many pet retailers and online at Furry Travelers where AAA members receive 15 percent off on all travel-related pet products. AAA is the third largest affiliate of AAA, with 78 branch offices serving 4.1 million members in Florida, Georgia, West and Middle Tennessee, and Puerto Rico. Since its founding in 1938, AAA has worked to protect and advance freedom of mobility and improve travel safety. The online survey of 168 AAA members in Florida was conducted April 27 thru May 11, 2010. The overall maximum margin of error is plus/minus 7.6 percentage points.